According to the Center for America (CFA), too many employers lack the type of information needed, and the proper networking connections, to successfully hire veterans leaving the military. In an effort to fully understand the reasons why more than 1 million veterans remain unemployed, CFA is conducting a brief online survey of employers. The survey questions will help the organization identify the challenges companies face in hiring veterans, so that it can develop free, industry-specific networking and web-based education resources. The goal: to help connect employers with the right military candidates to fill their open positions. Please take the survey today. Enter the code N262 to allow CFA to associate your response with PMA. Attend the highly anticipated 2016 Manufacturing ERP Experience on April 5-6 in Minneapolis, and elevate your company to supERPower status. Whether you’re in the market to purchase new software or want to learn how to better use your current platform, this conference will give you an in-depth look into the technology and show how it can significantly improve efficiencies and maximize profitability. 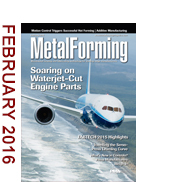 The authority on late-breaking metalforming news. 69 percent of CFOs are confident about the companies’ business prospects in 2016. 68 percent say that growth in existing markets is a priority in 2016—an 8-percent uptick from last year. 54 percent express optimism regarding the overall health of the U.S. economy. 68 percent have rising healthcare costs at the top of their list of cost concerns. 24 percent fewer survey respondents, compared to last year, are worried about their ability to maintain margins. Download the complete survey results here. Fiat Chrysler recently increased annual capacity at its Warren Stamping plant with the installation of a new high-speed servo tandem press. The press bumps the 2.1-million-sq.-ft. plant’s production capacity to nearly 84 million parts annually. The press's servo drive allows for programmable control and movement of ram speed at any position in the press stroke. The technology, the company says, also allows for more frequent and quicker die changes--in about 4 min. as compared to 20 min. with older presses. In addition to the new press, the facility also operates 12 major press lines and three large progressive lines. Last week the company posted this 6-min. video tour showcasing several of its lines. Cameras provide a close-up look inside the dies, as well as a look at modern automation technology, AGVs used to transport racks of stamped parts and a bevy of robots performing spot welding. Missouri Metals decided to construct its own press to produce titanium parts. Key to the system is a motion controller that enables independent cylinder control, and allows the company to produce two parts in the press simultaneously while dramatically reducing material waste. The addition of a servo-driven press at Bayloff Stamped Products allows the Michigan metalformer to increase capacity while gaining expertise on just what servo technology can deliver.